Best. Thing. Ever. Warm Cupcake from Midnite Confection’s Cupcakery. It’s always nice to get a cupcake break during the middle of the week, especially if it just happens to be on a gorgeous spring afternoon! Recently, I was out and about for a work errand when I found myself in the Federal Hill area. For me, this means one thing: Midnite Confection’s. Luckily my work related outing overlapped with my lunch break, so I happily found myself parked in front of Midnite Confection’s adorable little shop just minutes after they opened. While we haven’t written much about Midnite Confection’s on our blog, we’ve eaten tons of their cupcakes and even listed them in our Top 5 cupcakeries inside Baltimore City during our guest series on KimberlyLoc.com. There is one cupcake flavor that they carry from time to time I’ve been longing to try… Sinnabon. It is currently their flavor of the month, so I walked in with full expectations of finally conquering this flavor. Unfortunately, I was a little too early and the cupcake was still too warm to frost. I didn’t have time to wait, so instead I chose their flavor of the week, Butter Pecan. The two gentlemen working that day informed me that the Butter Pecan was still warm, since it had just cooled enough to frost, and that if possible, I should eat it right away. I hadn’t eaten lunch yet though, so I wasn’t sure if that would be the best idea. Well, it only took about three seconds for me to change my mind. Sitting in my car, I waited just long enough to take a quick photo before devouring the warm buttery goodness. My first bite was like a little piece of heaven. The warm moist cake was full of pecan flavor and had a slight crunch on the top which added a great texture. I’m now convinced that everyone should head to Midnite Confection’s when they first open and ask what cupcakes are warm and fresh from the oven. It just might be the best way to eat a cupcake. In all my cupcake eating experience, this was a first for me. I hope to repeat it one day soon… There’s a week left in May, which means I still have time to attempt finally to try the Sinnabon cupcake. I can only imagine how amazing that will be warm. 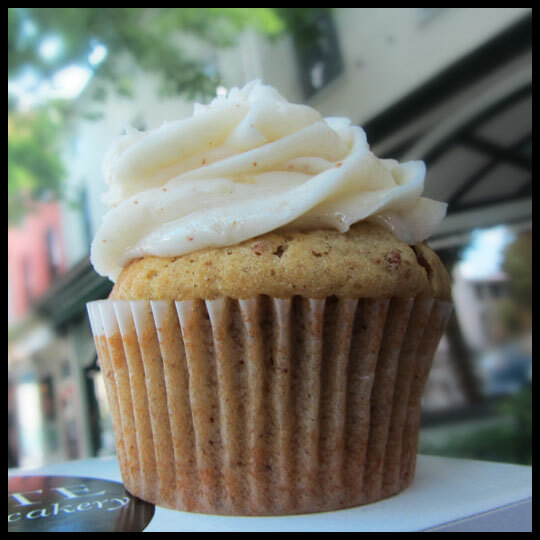 This entry was posted in Baltimore, Cupcakes, Maryland and tagged baltimore, butter pecan, Cupcake, Federal Hill, Midnite Confections, pecan, warm cupcake by Stacy. Bookmark the permalink. Oh man…the Sinnabon would be so good when it’s just warm enough to frost! Actually, even if it wasn’t ready, I might even say, “I don’t care. Frost it anyway.” Melted goodness on top of what I’m guessing is a cinnamon cupcake has got to be the way to go with that one! I know…. Man. I want that so bad.